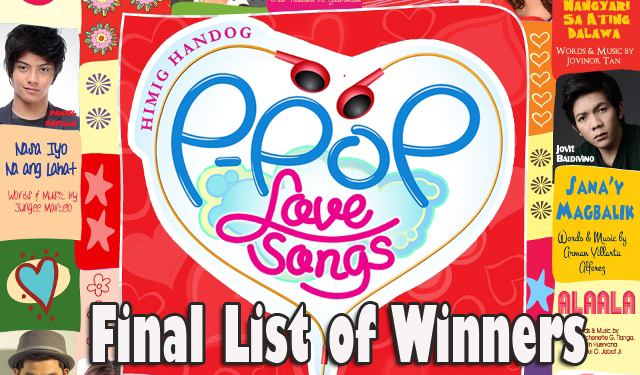 The Final List of winners of Himig Handog P-Pop Love Songs 6th Edition finally released. The finals night was held in the Smart Araneta Coliseum on September 28. As we all know, Himig Handog P-Pop Love Songs opened for entries since November 15 until January 31, 2014. Amateur and professional song writers, solo or group with as much as 3 members, who aspire to write Original Pinoy Music love songs were invited to express themselves in the prestigious competition. The 15 finalists songs were given a chance to be interpreted by artists and each one was made by various universities. Here are the Final List of Winners of Himig Handog 2014 P-pop Love Songs..
‘Mahal Ko o Mahal Ako’ composed by Edwin Marollano, sung KZ Tandingan and made into video by San Sebastian College-Recoletos. The song is about choosing between the person she love and the person who loves her. ‘Halik sa Hangin’ is composed by David Dimaguila and sung by Ebe Dancel and Abra, while the music video is made by University of the East. The song is about a love that was cut short and if only he had another chance to get it back. ‘Mahal kita Pero’ is composed by Melchora Mabilog, interpreted by Janella Salvador and the music video is by San Beda College Alabang. The song is about a college girl who loves a guy that her family disapporves of. ‘Walang Basagan ng Trip’ is composed by Eric de Leon and sung by Jugs Jugueta and Teddy Corpuz. This music video made by Miriam College is about the things people use to do everyday and expressing how people should just let them be. ‘Hindi Wala’ is composed by Nica Del Rosarion, sung by Juris and made into video by De La Salle- College of St. Benilde. This song is about the negative comments in life and having hopes despite them. The Himig Handog P-Pop Love Songs 6th Edition Final Top 15 finalists songs were given a chance to be interpreted by artists and each one was made by various universities. The competition strives to make OPM hits alive again in the Philippine music industry.